Getting around on the Internet while on your cell phone is handy, but if you have multiple things to do it can be a massive pain in the behind. With the number of laptops, netbooks and tablets out there these days it is always the better way to navigate the Internet as opposed to a tiny screen. Wireless broadband dongles are okay, but they don't work with anything without a USB port, and you just simply need to connect via Wi-Fi. 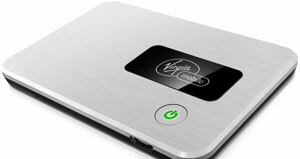 Thank goodness for devices such as Virgin Mobile's MiFi 2200. 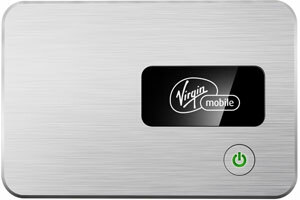 While the MiFi has been available for some time, Virgin Mobile has added a new twist to the device by removing the need for a contract and letting you pay as you go. The company was nice enough to send us over one for testing, and it luckily arrived just before I was going out of town for the day so I could test it under various conditions. Although the device is labeled as Virgin Mobile, the connectivity is handled on the Sprint network. With that in mind I immediately fired it up inside my house which is notorious for poor Sprint reception and it found the network in seconds. Color me impressed as most phones have a heck of a time in my house. Next we were off on the road, and while I was driving, I walked my passenger through turning on the device and connecting it with my iPad. She was online in short order, and while we did occasionally lose signal while in the car, it was fairly acceptable as I was doing 70 MPH (the speed limit, I swear) on a secondary highway. This was followed up by me trying it in a doctor's office, a restaurant and just about anywhere else we went through out the day, and it always connected quickly and reliably. No, it wasn't blazing fast it is converting a 3G signal to Wi-Fi, but it was more than acceptable for some lite Web surfing and doing e-mail. As for the physical size of the device, it is shockingly small and lightweight. It easily slipped into my pocket, but do be careful as the power button is very easy to hit. The size and weight isn't even a factor in the decision to take this on a trip with you. The only drawback to the device is the initial $149.99 price tag, but that is because you are buying this without a contract, and hence no subsidy. That is also its biggest strength because numerous people only need a device like this occasionally, and if you get one on contract you are paying for the connection even when you aren't using it. Virgin Mobile allows you to buy only what you need. Sadly, the unused data does not roll over, and does expire, but that isn't exactly a deal breaker. If you are an infrequent traveler, and only occasionally need to have mobile broadband access, this is the perfect solution for you, and I give it a high recommendation based both on convenience and reliability of the device.